Initial characterization of the large genome of the salamander Ambystoma mexicanum using shotgun and laser capture chromosome sequencing. 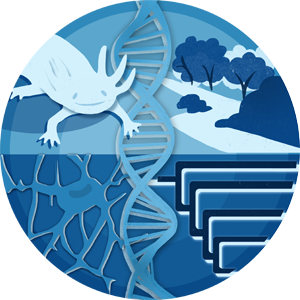 Title Initial characterization of the large genome of the salamander Ambystoma mexicanum using shotgun and laser capture chromosome sequencing. Vertebrates exhibit substantial diversity in genome size, and some of the largest genomes exist in species that uniquely inform diverse areas of basic and biomedical research. For example, the salamander Ambystoma mexicanum (the Mexican axolotl) is a model organism for studies of regeneration, development and genome evolution, yet its genome is ~10× larger than the human genome. As part of a hierarchical approach toward improving genome resources for the species, we generated 600 Gb of shotgun sequence data and developed methods for sequencing individual laser-captured chromosomes. Based on these data, we estimate that the A. mexicanum genome is ~32 Gb. Notably, as much as 19 Gb of the A. mexicanum genome can potentially be considered single copy, which presumably reflects the evolutionary diversification of mobile elements that accumulated during an ancient episode of genome expansion. Chromosome-targeted sequencing permitted the development of assemblies within the constraints of modern computational platforms, allowed us to place 2062 genes on the two smallest A. mexicanum chromosomes and resolves key events in the history of vertebrate genome evolution. Our analyses show that the capture and sequencing of individual chromosomes is likely to provide valuable information for the systematic sequencing, assembly and scaffolding of large genomes.